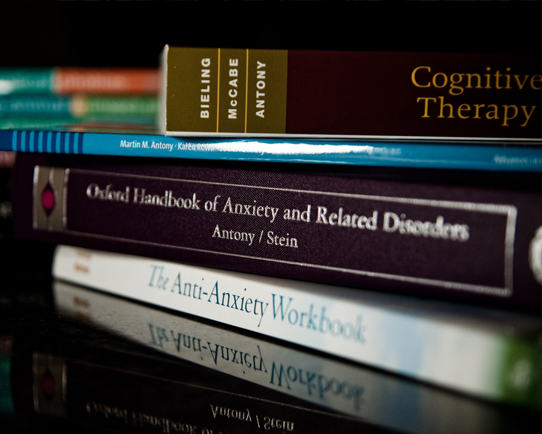 Below is a list of recent publications from the Anxiety Research and Treatment Lab. Names of students and faculty members from Ryerson University are printed in bold. Reprint requests may be sent to Dr. Martin M. Antony at mantony@psych.ryerson.ca. Constantino, M.J., Romano, F.M., Coyne, A.E., Westra, H.A., & Antony, M.M. (in press). Client interpersonal impacts as mediators of long-term outcome in cognitive-behavioral therapy integrated with motivational interviewing for generalized anxiety disorder. Psychotherapy Research. For link to abstract, click here. Constantino, M.J., Westra, H.A., Antony, M.M., & Coyne, A.E. (in press). Specific and common processes as mediators of the long-term effects of cognitive-behavioral therapy integrated with motivational interviewing for generalized anxiety disorder. Psychotherapy Research. For link to abstract, click here. Coyne, A.E., Constantino, M.J., Laws, H.B., Westra, H.A., & Antony, M.M. (in press). Patient-therapist convergence in alliance ratings as a predictor of outcome in psychotherapy for generalized anxiety disorder. Psychotherapy Research. For link to abstract, click here. Gomez Penedo, J.M., Constantino, M.J., Coyne, A.E., Westra, H.A., & Antony, M.M. (in press). Markers for context-responsiveness: Client baseline interpersonal problems moderate the efficacy of two psychotherapies for generalized anxiety disorder. Journal of Consulting and Clinical Psychology. For link to abstract, click here. Hara, K.M., Westra, H.A., Constantino, M.J., & Antony, M.M. (in press). The impact of resistance on empathy in cognitive-behavioral therapy for generalized anxiety disorder. Psychotherapy Research. For link to abstract, click here. Krause, K.L., MacDonald, E.M., Goodwill, A., Vorstenbosch, V., & Antony, M.M. (in press). Assessing safety behaviors in fear of storms: Validation of the Storm-Related Safety Behavior Scale. Journal of Psychopathology and Behavioral Assessment. Lima, J., McCabe-Bennett, H., & Antony, M.M. (in press). Treatment of storm fears using virtual reality and progressive muscle relaxation. Behavioural and Cognitive Psychotherapy. Morrison, N.R., Constantino, M.J., Westra, H.A., Kertes, A., Goodwin, B.J., & Antony, M.M. (in press). Using interpersonal process recall to compare patients’ accounts of resistance in two psychotherapies for generalized anxiety disorder. Journal of Clinical Psychology: In Session. For link to abstract, click here. Pawluk, E.J., Koerner, N., Tallon, K., & Antony, M.M. (in press). Unique correlates of problem solving effectiveness in individuals with generalized anxiety disorder. Cognitive Therapy and Research. For link to abstract, click here. Wilson, G.A., Koerner, N., & Antony, M.M. (in press). An examination of feedback seeking in individuals with social anxiety disorder, generalized anxiety disorder, or no history of mental disorder using a daily diary method. Journal of Cognitive Psychotherapy. Desnoyers, A., Kocovski, N.L., Fleming, J.E., & Antony, M.M. (2017). Self-focused attention and safety behaviors across group therapies for social anxiety disorder. Anxiety, Stress, and Coping, 30, 441-455. For link to abstract, click here. Fairbrother, N., Young, A.H., Zhang, A., Janssen, P., & Antony, M.M. (2017). The prevalence and incidence of perinatal anxiety disorders among women experiencing a medically complicated pregnancy. Archives of Women’s Mental Health, 20, 311-319. For link to abstract, click here. Hara, K.M., Aviram, A., Constantino, M.J., Westra, H.A., & Antony, M.M. (2017). Therapist empathy, homework compliance and outcome in cognitive-behavioural therapy for generalized anxiety disorder: Partitioning within- and between-therapist effects. Cognitive Behaviour Therapy, 46, 375-390. For link to abstract, click here. MacKenzie, M.B., Kocovski, N.L., Blackie, R.A., Carrique, L., Fleming, J.E., & Antony, M.M. (2017). Development of a brief version of the Social Anxiety – Acceptance and Action Questionnaire. Journal of Psychopathology and Behavioral Assessment, 39, 342-354. For link to abstract, click here. Vickers, K., Ein, N., Koerner, N., Kusec, A., McCabe, R.E., Rowa, K., & Antony, M.M. (2017). Self-reported hygiene-related behaviors among individuals with contamination-related obsessive-compulsive disorder, individuals with anxiety disorders, and nonpsychiatric controls. Journal of Obsessive-Compulsive and Related Disorders, 14, 71-83. For link to abstract, click here. Waechter, S., Rowa, K., Milosevic, I., Shnaider, P., Antony, M.M., & McCabe, R.E. (2017). Social anxiety and the accuracy of memory for childhood teasing frequency. Journal of Cognitive Psychotherapy, 31, 151-157. For link to abstract, click here. Aviram, A., Westra, H.A., Constantino, M.J., & Antony, M.M. (2016). Responsive management of resistance in cognitive-behavioral therapy for generalized anxiety disorder. Journal of Consulting and Clinical Psychology, 84, 783-794. For link to abstract, click here. Fairbrother, N., Janssen, P., Antony, M.M., Tucker, E., & Young, A.H. (2016). Perinatal anxiety disorder prevalence and incidence. Journal of Affective Disorders, 200, 148-155. For link to abstract, click here. Kocovski, N.L., MacKenzie, M.B., Albiani, J.L., Battista, S.R., Noel, S., Fleming, J.E., & Antony, M.M. (2016). Safety behaviors and social anxiety: An examination of the Social Phobia Safety Behaviours Scale. Journal of Psychopathology and Behavioral Assessment, 38, 87-100. For link to abstract, click here. McMurtry, C.M., Taddio, A., Noel, M., Antony, M.M., Chambers, C.T., Asmundson, G.J.G., Pillai Riddell, R., Shah, V., MacDonald, N.E., Rogers, J., Bucci, L.M., Mousmanis, P., Lang, E., Halperin, S., Bowles, S., Halpert, C., Ipp, M., Rieder, M.J., Robson, K., Uleryk, E., Votta Bleeker, E., Dubey, V., Hanrahan, A., Lockett, D., & Scott, J. (2016). : A clinical practice guideline and call for further research. Cognitive Behaviour Therapy, 45, 217-235. For link to abstract, click here. Nowakowski, M.E., Rowa, K., Antony, M.M., & McCabe, R.E. (2016). Changes in anxiety sensitivity following group cognitive-behavior therapy for social anxiety disorder and panic disorder. Cognitive Therapy and Research, 40, 468-478. For link to abstract, click here. Shikatani, B., Antony, M.M., Cassin, S.E., & Kuo, J.R. (2016). Examining the role of perfectionism and intolerance of uncertainty in postevent processing in social anxiety disorder. Journal of Psychopathology and Behavioral Assessment, 38, 297-306. For link to abstract, click here. Westra, H.A., Constantino, M.J., & Antony, M.M. (2016). Integrating motivational interviewing with cognitive-behavioral therapy for severe generalized anxiety disorder: An allegiance-controlled randomized clinical trial. Journal of Consulting and Clinical Psychology, 84, 768-782. For link to abstract, click here. Wilson, G. A., Krause, K. L., & Antony, M. M. (2016). Anxiety, panic, and phobias. In H. Friedman (Ed. ), Encyclopedia of mental health, 2nd ed (pp. 74-80). Waltham, MA: Academic Press. Birnie, K.A., Chambers, C., Taddio, A., McMurtry, C.M., Noel, M., Pillai Ridell, R., Shah, V., & the HELPinKids&Adults Team (including Antony, M.M.) (2015). Psychological interventions for vaccine injections in children and adolescents: Systematic review of randomized and quasi-randomized controlled trials. Clinical Journal of Pain, 31, S72 – S89. For link to abstract, click here. Boerner, K.E., Birnie, K.A., Chambers, C., Taddio, A., McMurtry, C.M., Noel, M., Shah, V., Pillai Ridell, R., & the HELPinKids&Adults Team (including Antony, M.M.) (2015). Simple psychological interventions for reducing pain from common needle procedures in adults: Systematic review of randomized and quasi-randomized controlled trials. Clinical Journal of Pain, 31, S90 – S98. For link to abstract, click here. Fairbrother, N., Young, A.H., Janssen, P., Antony, M.M., & Tucker, E. (2015). Depression and anxiety during the perinatal period. BMC Psychiatry, 15:206. DOI 10.1186/s12888-015-0526-6. For PDF of article, click here. Gallo, K.P., Comer, J.S., Barlow, D.H., Clarke, R.N., & Antony, M.M. (2015). Direct-to-consumer marketing of psychological treatments: A randomized controlled trial. Journal of Consulting and Clinical Psychology, 83, 994-998. For link to abstract, click here. Gros, D.F., Farmer, A.S., McCabe, R.E., & Antony, M.M. (2015). Psychometric evaluation of the Multidimensional Assessment of Social Anxiety before and after cognitive behavioral therapy for social anxiety disorder. Journal of Psychopathology and Behavioral Assessment, 37, 144-152. For link to abstract, click here. Hara, K.M., Westra, H.A., Aviram, A., Button, M.L., Constantino, M.J., & Antony, M.M. (2015). Therapist awareness of client resistance in cognitive-behavioural therapy for generalized anxiety disorder. Cognitive Behaviour Therapy, 44, 162-174. For link to abstract, click here. Kocovski, N.L., Fleming, J.E., Hawley, L.L., Ho, M.H.R., & Antony, M.M. (2015). Mindfulness and acceptance-based group therapy and traditional cognitive behavioral group therapy for social anxiety disorder: Mechanisms of change. Behaviour Research and Therapy, 70, 11-22. For link to abstract, click here. McMurtry, C.M., Noel, M., Taddio, A., Antony, M.M., Asmundson, G.J.G., Pillai Ridell, R., Chambers, C., Shah, V., & the HELPinKids&Adults Team (2015). Interventions for individuals with high levels of needle fear: Systematic review of randomized controlled trials and quasi-randomized controlled trials. Clinical Journal of Pain, 31, S109-S123. For link to abstract, click here. McMurtry, C.M., Pillai Ridell, R., Taddio, A., Racine, N., Asmundson, G.J.G., Noel, M., Chambers, C., Shah, V., and the HELPinKids&Adults Team (including Antony, M.M.) (2015). Far from “just a poke”: Common painful needle procedures and the development of needle fear. Clinical Journal of Pain, 31, S3 – S11. For link to abstract, click here. Moscovitch, D.A., Rowa, K., Paulitzky, J.R., Antony, M.M., & McCabe, R.E. (2015). What if I appear boring, anxious, or unattractive? Validation and treatment sensitivity of the Negative Self Portrayal Scale in clinical samples. Cognitive Therapy and Research, 39, 178-192. For link to abstract, click here. Noel, M., Taddio, A., McMurtry, C.M., Chambers, C., Pillai Ridell, R., Shah, V., & the HELPinKids&Adults Team (including Antony, M.M.) (2015). HelpinKids&Adults knowledge synthesis of the management of vaccination pain and high levels of needle fear: Limitations of the evidence and recommendations for future research. Clinical Journal of Pain, 31, S124-S131. For link to abstract, click here. Nowakowski, M.E., Antony, M.M., & Koerner, N. (2015). Modifying interpretation biases: Effects on symptomatology, behavior, and physiological reactivity in social anxiety. Journal of Behavior Therapy and Experimental Psychiatry, 49, 44-52. For link to abstract, click here. Pillai Ridell, R., Taddio, A., McMurtry, C.M., Chambers, C., Shah, V., Noel, M., & the HELPinKids&Adults Team (including Antony, M.M.) (2015). Psychological interventions for vaccine injections in young children 0 to 3 years: Systematic review of randomized controlled trials and quasi-randomized controlled trials. Clinical Journal of Pain, 31, S64 – S71. For link to abstract, click here. Pillai Ridell, R., Taddio, A., McMurtry, C.M., Shah, V., Noel, M., Chambers, C., and the HELPinKids&Adults Team (including Antony, M.M.) (2015). Process interventions for vaccine injections: Systematic review of randomized controlled trials and quasi-randomized controlled trials. Clinical Journal of Pain, 31, S99 – S108. For link to abstract, click here. Rowa, K., Paulitzki, J.R., Ierullo, M.D., Chiang, B., Antony, M.M., McCabe, R.E., & Moscovitch, D.A. (2015). A false sense of security: Safety behaviors erode objective speech performance in individuals with social anxiety disorder. Behavior Therapy, 46, 304-314. For link to abstract, click here. Shah, V., Taddio, A., McMurtry, C.M., Halperin, S.A., Noel, M., Pillai Ridell, R., Chambers, C., & the HELPinKids&Adults Team (including Antony, M.M.) (2015). Pharmacological and combined interventions to reduce vaccine injection pain in children and adults: Systematic review and meta-analysis. Clinical Journal of Pain, 31, S38 – S63. For link to abstract, click here. Taddio, A., Shah, V., McMurtry, C.M., MacDonald, N.E., Ipp, M., Pillai Ridell, R., Noel, M., Chambers, C., & the HELPinKids&Adults Team (including Antony, M.M.) (2015). Procedural and physical interventions for vaccine injections: Systematic review of randomized controlled trials and quasi-randomized controlled trials. Clinical Journal of Pain, 31, S20 – S37. For link to abstract, click here. Taddio, , McMurtry, C.M., Shah, V., Pillai Riddell, R., Chambers, C., Noel, M., MacDonald, N.E., Rogers, J., Bucci, L., Mousmanis, P., Lang, E., Halperin, S.A., Bowles, S., Halpert, C., Ipp, M., Asmundson, G.J.G., Rieder, M.J., Robson, K., Uleryk, E., Antony, M.M, Dubey, V., Hanrahan, A., Lockett, D., Scott, J., Votta Bleeker E., & the HELPinKids&Adults Team (2015). Reducing pain during vaccine injections: Clinical practice guideline. Canadian Medical Association Journal, 187, 975-982. For PDF of article, click here. Taddio, A., McMurtry, C.M., Shah, V., Yoon, E.W., Uleryk, E., Pillai Ridell, R., Lang, E., Chambers, C., Noel, M., MacDonald, N.E., & the HELPinKids&Adults Team (including Antony, M.M.) (2015). Methodology for knowledge synthesis of the management of vaccination pain and needle fear. Clinical Journal of Pain, 31, S12 – S19. For link to abstract, click here. Vorstenbosch, V., Antony, M.M., Monson, C.M., & Rowa, K. (2015). Family accommodation in problem hoarding. Journal of Obsessive-Compulsive and Related Disorders, 7, 7-15. For link to abstract, click here. Carleton, R.N., Duranceau, S., Freeston, M.H., Boelin, P.A., McCabe, R.E., & Antony, M.M. (2014). “But it might be a heart attack”: Intolerance of uncertainty and panic disorder symptoms. Journal of Anxiety Disorders, 28, 463-470. For link to abstract, click here. Farmer, A.S., Gros, D.F., McCabe, R.E., & Antony, M.M. (2014). Clinical predictors of diagnostic status in individuals with social anxiety disorder. Comprehensive Psychiatry, 55, 1906-1913. For link to abstract, click here. Fracalanza, K., Koerner, N., & Antony, M.M. (2014). Testing a procedural variant of written imaginal exposure for generalized anxiety disorder. Journal of Anxiety Disorders, 28, 559-569. For link to abstract, click here. Fracalanza, K., McCabe, R.E., Taylor, V.H., & Antony, M.M. (2014). The effect of comorbid major depressive disorder or bipolar disorder on cognitive-behavioral therapy for social anxiety disorder. Journal of Affective Disorders, 162, 61-66. For link to abstract, click here. Henderson, L.C., Antony, M.M., & Koerner, N. (2014). Psychometric properties of the Generalized Anxiety Disorder Inventory (GADI) in a Canadian Sample. Journal of Psychopharmacology, 28, 440-448. For link to abstract, click here. Katzman, M.A., Bleau, P., Chokka, P., Kjernisted, K., Van Ameringen, M., and the Canadian Anxiety Guidelines Initiative Group (including Antony, M.M.) (2014). Canadian clinical practice guidelines for the management of anxiety, posttraumatic stress and obsessive-compulsive disorders. BMC Psychiatry, 14 (Suppl 1), 1-83. For a PDF of the guidelines, click here. LeMoult, J., Rowa, K., Antony, M.M., Chudzik, S., & McCabe, R.E. (2014). Impact of comorbid depression on cognitive behavioral group treatment for social anxiety disorder. Behaviour Change, 31, 53-64. For link to abstract, click here. Nelson, A.L., Vorstenbosch, V., & Antony, M.M. (2014). Assessing fear of storms and severe weather: Validation of the Storm Fear Questionnaire (SFQ). Journal of Psychopathology and Behavioral Assessment, 36, 105-114. For link to abstract, click here. Rowa, K., Gifford, S., McCabe, R., Antony, M.M., & Purdon, C. (2014). Treatment fears in anxiety disorders: Development and validation of the Treatment Ambivalence Questionnaire. Journal of Clinical Psychology, 70, 979-993. For link to abstract, click here. Rowa, K., McCabe, R.E., Antony, M.M., & Swinson, R.P. (2014). A preliminary attempt to experimentally induce post-event processing in social anxiety disorder. Behavioural and Cognitive Psychotherapy, 42, 238-242. For link to abstract, click here. Sherry, S.B., Sherry, D.L., Macneil, M.A., Smith, M.M., Mackinnon, S.P., Stewart, S.H., & Antony, M.M. (2014). Does socially prescribed perfectionism predict daily conflict? A 14-day daily diary study of romantic couples using self- and partner-reports. Personality and Individual Differences, 61-62, 24-27. For link to abstract, click here. Shikatani, B., Antony, M.M., Kuo, J.R., & Cassin, S.E. (2014). The impact of cognitive restructuring and mindfulness strategies on postevent processing and affect in social anxiety disorder. Journal of Anxiety Disorders, 28, 570-579. For link to abstract, click here. Summerfeldt, L.J., Kloosterman, P.H., Antony, M.M., & Swinson, R.P. (2014). Examining an obsessive-compulsive core dimensions model: Structural validity of harm avoidance and incompleteness. Journal of Obsessive-Compulsive and Related Disorders, 3, 83-94. For link to abstract, click here. Gee, B.A., Antony, M.M., & Koerner, N. (2013). Disclosure of anxiety in everyday life: Effects of social anxiety. Personality and Individual Differences, 54, 438-441. For link to abstract, click here. Gee, B.A., Antony, M.M., & Koerner, N. (2013). How do people perceive the disclosure of emotion? Cognitive Therapy and Research, 37, 579-586. For link to abstract, click here. Gros, D.F., McCabe, R.E., & Antony, M.M. (2013). Using a hybrid model to investigate the comorbidity and symptom overlap between social phobia and the other anxiety disorders and unipolar mood disorders. Psychiatry Research, 210, 188-192. For link to abstract, click here. Kocovski, N.L., Fleming, J.E., & Antony, M.M. (2013). Mindfulness and acceptance-based group therapy versus traditional cognitive behavioral group therapy for social anxiety disorder: A randomized controlled trial. Behaviour Research and Therapy, 51, 889-898. For link to abstract, click here. Koerner, N., Antony, M.M., Young, L., & McCabe, R.E. (2013). Changes in beliefs about social competence of self and others following group cognitive-behavioral treatment. Cognitive Therapy and Research, 37, 256-265. For link to abstract, click here. MacDonald, E.M., Koerner, N., & Antony, M.M. (2013). Modification of interpretive bias: Impact on anxiety sensitivity, information processing and response to induced bodily sensations. Cognitive Therapy and Research, 37, 860-871. For link to abstract, click here. Mathewson, K.J., Schmidt, L.A., Miskovic, V., Santesso, D.L., Duka, E., McCabe, R.E., Antony, M.M., & Moscovitch, D.A. (2013). Does respiratory sinus arrhythmia (RSA) predict anxiety reduction during cognitive behavioral therapy (CBT) for social anxiety disorder (SAD)? International Journal of Psychophysiology, 88, 171-181. For link to abstract, click here. Moscovitch, D.A., Rowa, K., Paulitzky, J.R., Ierullo, M.D., Chiang, B., Antony, M.M., & McCabe, R.E. (2013). Self-portrayal concerns and their relation to safety behaviors and negative affect in social anxiety disorder. Behaviour Research and Therapy, 51, 476-486. For link to abstract, click here. Mushquash, A.R., Stewart, S.H., Sherry, S.B., Mackinnon, S.P., Antony, M.M., & Sherry, D.L. (2013). Heavy episodic drinking among dating partners: A longitudinal actor-partner interdependence model. Psychology of Addictive Behaviors, 27, 178-183. For link to abstract, click here. Nowakowski, M.E., & Antony, M.M. (2013). Reactions to teasing in social anxiety. Cognitive Therapy and Research, 37, 1091-1100. For link to abstract, click here. Sherry, S.B., MacKinnon, A.L., Fossum, K., Antony, M.M., Stewart, S.H., Sherry, D.L., Nealis, L.J., & Mushquash, A.R. (2013). Perfectionism, discrepancies, and depression: Testing the perfectionism social disconnection model in a short-term, four-wave longitudinal study. Personality and Individual Differences, 54, 692-697. For link to abstract, click here. Van Dam, N.T., Gros, D.F., Earleywine, M., & Antony, M.M. (2013). Establishing a trait anxiety threshold that signals likelihood of anxiety disorders. Anxiety, Stress, and Coping, 26, 70-86. For link to abstract, click here. Carleton, R.N., Mulvogue, M., Thibodeau, M.A., McCabe, R.E., Antony, M.M., & Asmundson, G.J.G. (2012). Increasingly certain about uncertainty: Intolerance of uncertainty across anxiety and depression. Journal of Anxiety Disorders, 26, 468-479. For link to abstract, click here. Carleton, R.N., Weeks, J.W., Howell, A.N., Asmundson, G.J.G., Antony, M.M., & McCabe, R.E. (2012). Assessing the latent structure of the intolerance of uncertainty construct: An initial taxometric analysis. Journal of Anxiety Disorders, 26, 150-157. For link to abstract, click here. Gee, B.A., Antony, M.M., Koerner, N., & Aiken, A. (2012). Appearing anxious leads to negative judgments by others. Journal of Clinical Psychology, 68, 304-318. For link to abstract, click here. Gee, B.A., Antony, M.M., & Koerner, N. (2012). Do socially anxious individuals fear embarrassment by close others? Development of the Fear of Embarrassment by Others Scale. Personality and Individual Differences, 52, 340-344. For link to abstract, click here. Gros, D.F., Simms, L.J., Antony, M.M., & McCabe, R.E. (2012). Development and psychometric evaluation of the Multidimensional Assessment of Social Anxiety (MASA). Journal of Clinical Psychology, 68, 432-447. For link to abstract, click here. Gros, D.F., Stauffacher Gros, K., McCabe, R.E., & Antony, M.M. (2012). Psychometric evaluation of the factor structure of the Teasing Questionnaire – Revised (TQ-R). Journal of Psychopathology and Behavioral Assessment, 34, 542-551. For link to abstract, click here. Mackinnon, S.P., Sherry, S.B., Antony, M.M., Stewart, S.H., Sherry, D.L., & Hartling, N. (2012). Caught in a bad romance: Perfectionism, conflict and depression in romantic relationships. Journal of Family Psychology, 26, 215-225. For link to abstract, click here. Monforton, J., Vickers, K., & Antony, M.M. (2012). “If only I didn’t embarrass myself in front of the class!”: Social anxiety and upward counterfactual thinking. Journal of Social and Clinical Psychology, 31, 312-328. For link to abstract, click here. Moscovitch, D.A., Gavric, D.L., Senn, J., Santesso, D.L., Miskovic, V., Schmidt, L.A., McCabe, R.E., & Antony, M.M. (2012). Changes in judgment biases and use of emotion regulation strategies during cognitive behavioral therapy for social anxiety disorder: Distinguishing treatment responders from nonresponders. Cognitive Therapy and Research, 36, 261-271. For link to abstract, click here. Schmidt, L.A., Santesso, D.L., Miscovic, V., Mathewson, K.J., McCabe, R.E., Antony, M.M., & Moscovitch, D.A. (2012). Test-retest reliability of regional electroencephalogram (EEG) and cardiovascular measures in social anxiety disorder (SAD). International Journal of Psychophysiology, 84, 65-73. For link to abstract, click here. Vorstenbosch, V., Antony, M.M., Koerner, N., & Boivin, M.K. (2012). Assessing dog fear: Evaluating the psychometric properties of the Dog Phobia Questionnaire. Journal of Behavior Therapy and Experimental Psychiatry, 43, 780-786. For link to abstract, click here. Vorstenbosch, V., Hood, H.K., Rogojanski, J., Antony, M.M., Summerfeldt, L.J., & McCabe, R.E. (2012). Exploring the relationship between OCD symptom subtypes and domains of functional impairment. Journal of Obsessive-Compulsive and Related Disorders, 1, 33-40. For link to abstract, click here. Antony, M.M. (2011). Recent advances in the treatment of anxiety disorders. Canadian Psychology, 52, 1-9. For link to abstract, click here. Carleton, R.N., Collimore, K.C., McCabe, R.E., & Antony, M.M. (2011). Addressing revisions to the Brief Fear of Negative Evaluation Scale: Measuring fear of negative evaluation across anxiety and mood disorders. Journal of Anxiety Disorders, 25, 822-828. For link to abstract, click here. Fracalanza, K.A., McCabe, R.E., Taylor, V.H., & Antony, M.M. (2011). Bipolar disorder comorbidity in anxiety disorders: Relationship to demographic profile, symptom severity, and functional impairment. European Journal of Psychiatry, 25, 223-233. For link to abstract, click here. Gros, D.F., Antony, M.M., McCabe, R.E., & Lydiard, R.B. (2011). A preliminary investigation of the effects of cognitive behavioral therapy for panic disorder on gastrointestinal distress in patients with comorbid panic disorder and irritable bowel syndrome. Depression and Anxiety, 28, 1027-1033. For link to abstract, click here. Gros, D.F., Simms, L.J., & Antony, M.M. (2011). A hybrid model of social phobia: An analysis of social anxiety and related symptoms of anxiety. Journal of Clinical Psychology, 67, 293-307. For link to abstract, click here. Martin-Pichora, A.L., & Antony, M.M. (2011). Successful treatment of olfactory reference syndrome with cognitive behavioral therapy: A case study. Cognitive and Behavioral Practice, 18, 545-554. For link to abstract, click here. Miscovic, V., Moscovitch, D.A., Santesso, D.L., McCabe, R.E., Antony, M.M., & Schmidt, L.A. (2011). Changes in EEG cross-frequency coupling during cognitive behavioral therapy for social anxiety disorder. Psychological Science, 22, 507-516. For link to abstract, click here. Moscovitch, D.A., Santesso, D.L., Miskovic, V., McCabe, R.E., Antony, M.M., & Schmidt, L.A. (2011). Frontal EEG asymmetry and symptom response to cognitive behavioral therapy in patients with social anxiety disorder. Biological Psychology, 87, 379-385. For link to abstract, click here. Purdon, C., Gifford, S., McCabe, R., & Antony, M.M. (2011). Thought dismissability in obsessive-compulsive disorder versus panic disorder. Behaviour Research and Therapy, 49, 646-653. For link to abstract, click here. Rogojanski, J., Vettese, L.C., & Antony, M.M. (2011). Coping with cigarette cravings: Comparison of a suppression versus mindfulness-based strategy. Mindfulness, 2, 14-26. For link to abstract, click here. Rogojanski, J., Vettese, L. C., & Antony, M. M. (2011). The role of sensitivity to anxiety symptoms in responsiveness to mindfulness versus suppression strategies for coping with smoking cravings. Journal of Clinical Psychology, 67, 439-445. For link to abstract, click here. Summerfeldt, L.J., Kloosterman, P.H., Antony, M.M., McCabe, R.E., & Parker, J.D.A. (2011). Emotional intelligence in social phobia and other anxiety disorders. Journal of Psychopathology and Behavioral Assessment, 33, 69-78. For link to abstract, click here. Wheeler, H.A., Blankstein, K.R., Antony, M.M., McCabe, R.E., & Bieling, P.J. (2011). Perfectionism in anxiety and depression: Comparisons across disorders, relations with symptom severity, and role of comorbidity. International Journal of Cognitive Therapy, 44, 66-91. For link to abstract, click here. Wuyek, L.A., Antony, M.M., & McCabe, R.E. (2011). Validation of the Panic Disorder Severity Scale: Clinician-administered and self-report versions. Clinical Psychology and Psychotherapy, 18,234-243. For link to abstract, click here. Carleton, R.N. Collimore, K.C., Asmundson, G.J.G., McCabe, R.E., Rowa, K., & Antony, M.M. (2010). SPINning factors: Factor analytic evaluation of the Social Phobia Inventory in clinical and nonclinical undergraduate samples. Journal of Anxiety Disorders, 24, 94-101. For link to abstract, click here. Federici, A., Summerfeldt, L.J., Harrington, J.L., McCabe, R.E., Purdon, C.L., Rowa, K., & Antony, M.M. (2010). Consistency between self-report and clinician-administered versions of the Yale-Brown Obsessive Compulsive Scale. Journal of Anxiety Disorders, 24, 729-733. For link to abstract, click here. Gros, D.F., Simms, L.J., & Antony, M.M. (2010). Psychometric properties of the State-Trait Inventory for Cognitive and Somatic Anxiety (STICSA) in friendship dyads. Behavior Therapy, 41, 277-284. For link to abstract, click here . Hood, H.K., Antony, M.M., Koerner, N., & Monson, C.M. (2010). The effects of safety behaviors on fear reduction during exposure. Behaviour Research and Therapy, 48, 1161-1169. For link to abstract, click here. Koerner, N., & Antony, M.M. (2010). Special series on disgust and phobic avoidance: A commentary. International Journal of Cognitive Therapy, 3, 52-63. For link to abstract, click here. Koerner, N., Antony, M.M., & Dugas, M.J. (2010). Limitations of the Hamilton Anxiety Rating Scale as a primary outcome measure in randomized, controlled trials of treatments for generalized anxiety disorder [letter]. American Journal of Psychiatry, 167, 103-104. For link to letter, click here. McCabe, R.E., Miller, J.L., Laugesen, N., Antony, M.M., & Young, L. (2010). The relationship between anxiety disorders in adults and recalled childhood teasing. Journal of Anxiety Disorders, 24, 238-243. For link to abstract, click here. Miskovic, V., Ashbaugh, A.R., Santesso, D.L., McCabe, R.E., Antony, M.M., & Schmidt, L.A. (2010). Frontal brain oscillations and social anxiety: A cross-frequency spectral analysis during baseline and speech anticipation. Biological Psychology, 83, 125-132. For link to abstract, click here. Weeks, J.W., Carleton, R.N., Asmundson, G.J.G., McCabe, R.E., & Antony, M.M. (2010). Social anxiety disorder carved at its joints: Evidence for the taxonicity of social anxiety disorder. Journal of Anxiety Disorders, 24, 734-742. For link to abstract, click here. Antony, M.M., & Swinson, R.P. (2017). Shyness and social anxiety workbook: Proven, step-by-step techniques for overcoming your fear, 3rd ed. Oakland, CA: New Harbinger Publications. Egan, S.J., Wade, T.D., Shafran, R., & Antony, M.M. (2014). Cognitive-behavioral treatment of perfectionism. New York, NY: Guilford Press. Antony, M.M., & Roemer, L. (2011). Behavior therapy. Washington, DC: American Psychological Association. (excerpts from chapters 3 and 4 reprinted in: VandenBos, G.R., Meidenbauer, E., & Frank-McNeil, J. (Eds.) (2014). Psychotherapy theories and techniques: A reader. Washington, DC: American Psychological Association). Owens, K.M.B., & Antony, M.M. (2011). Overcoming health anxiety: Letting go of your fear of illness. Oakland, CA: New Harbinger Publications. Antony, M.M., & Barlow, D.H. (Eds.) (2010). Handbook of assessment and treatment planning for psychological disorders, 2nd ed. New York, NY: Guilford Press. Butcher, J.N., Mineka, S., Hooley, J.M., Taylor, S., & Antony, M.M. (2010). Abnormal psychology (1st Canadian edition). Toronto, ON: Pearson Education Canada. Antony, M.M., & Norton, P.J. (2009). The anti-anxiety workbook: Proven strategies to overcome worry, panic, phobias, and obsessions. New York, NY: Guilford Press. (translated into Dutch, Italian, Korean). Antony, M.M., & Stein, M.B. (Eds.) (2009). Oxford handbook of anxiety and related disorders. New York, NY: Oxford University Press. Antony, M.M., & Swinson, R.P. (2009). When perfect isn’t good enough: Strategies for coping with perfectionism (2nd edition). Oakland, CA: New Harbinger Publications. (translated into Swedish). Antony, M.M., & Swinson, R.P. (2008). Shyness and social anxiety workbook: Proven, step-by-step techniques for overcoming your fear (2nd edition). Oakland, CA: New Harbinger Publications. (translated into simplified Mandarin, Spanish). Antony, M.M., Purdon, C., & Summerfeldt, L.J. (Eds.) (2007). Psychological treatment of OCD: Fundamentals and beyond. Washington, DC: American Psychological Association. Antony, M.M., & Rowa, K. (2007). Overcoming fear of heights: How to conquer acrophobia and live a life without limits. Oakland, CA: New Harbinger Publications. Antony, M.M., Craske, M.G., & Barlow, D.H. (2006). Mastering your fears and phobias (client workbook), 2nd ed. New York, NY: Oxford University Press. Antony, M.M., & Watling, M.A. (2006). Overcoming medical phobias: How to conquer fear of blood, needles, doctors, and dentists. Oakland, CA: New Harbinger Publications. Bieling, P.J., McCabe, R.E., & Antony, M.M. (2006). Cognitive behavioral therapy in groups. New York, NY: Guilford Press. (translated into Swedish, Portuguese). Craske, M.G., Antony, M.M., & Barlow, D.H. (2006). Mastering your Fears and Phobias (therapist guide), second edition. New York, NY: Oxford University Press. Antony, M.M., Ledley, D.R., & Heimberg, R.G. (Eds.) (2005). Improving outcomes and preventing relapse in cognitive behavioral therapy. New York, NY: Guilford Press. (translated into Finnish). Antony, M.M., & McCabe, R.E. (2005). Overcoming animal and insect phobias: How to conquer fear of dogs, snakes, rodents, bees, spiders, and more. Oakland, CA: New Harbinger Publications. (translated into Hebrew). Antony, M.M., & McCabe, R.E. (2004). 10 simple solutions to panic: How to overcome panic attacks, calm physical symptoms, and reclaim your life. Oakland, CA: New Harbinger Publications. (translated into Arabic, Dutch, French, Italian, Japanese, Polish, Spanish). Antony, M.M. (2004). 10 simple solutions to shyness: How to overcome shyness, social anxiety, and fear of public speaking. Oakland, CA: New Harbinger Publications. (translated into Arabic, Italian, Japanese, simplified Mandarin, Polish, Romanian, Spanish). Bieling, P.J., & Antony, M.M. (2003). Ending the depression cycle: A step-by-step guide for preventing relapse. Oakland, CA: New Harbinger Publications. (translated into Japanese). Antony, M.M., & Barlow, D.H. (Eds.) (2002). Handbook of assessment and treatment planning for psychological disorders. New York, NY: Guilford Press. (translated into traditional Mandarin). Antony, M.M., Orsillo, S.M., & Roemer, L. (Eds.) (2001). Practitioner’s guide to empirically-based measures of anxiety. New York, NY: Springer. Antony, M.M., & Swinson, R.P. (2000). Shyness and social anxiety workbook: Proven, step-by-step techniques for overcoming your fear. Oakland, CA: New Harbinger Publications. (translated into French, Korean, Polish, simplified Mandarin). Antony, M.M., & Swinson, R.P. (2000). Phobic disorders and panic in adults: A guide to assessment and treatment. Washington, DC: American Psychological Association. Antony, M.M., & Swinson, R.P. (1998). When perfect isn’t good enough: Strategies for coping with perfectionism. Oakland, CA: New Harbinger Publications (translated into Hebrew, Italian, Polish, Spanish, Turkish). Swinson, R.P., Antony, M.M., Rachman, S., & Richter, M.A. (Eds.) (1998). Obsessive compulsive disorder: Theory, research, and treatment. New York, NY: Guilford Press. Craske, M.G., Antony, M.M., & Barlow, D.H. (1997). Mastery of your specific phobia (therapist guide). New York, NY: Oxford University Press. Antony, M.M., Craske, M.G., & Barlow, D.H. (1995). Mastery of your specific phobia (client workbook). New York, NY: Oxford University Press. Antony, M.M. (in press). Behavior therapy. In D. Wedding & R.J. Corsini (Eds. ), Current psychotherapies (11th ed.). Boston, MA: Cengage Learning. Krause, K.L., & Antony, M.M. (in press). Treatment of anxiety and obsessive-compulsive related disorders. In S.G. Hofmann (Ed. ), Clinical psychology: A global perspective. Hoboken, NJ: Wiley Blackwell. Lenton-Brym, A.P., & Antony, M.M. (in press). Perfectionism. In J.S. Abramowitz & S.M. Blakey (Eds. ), Clinical handbook of fear and anxiety: Psychological processes and treatment mechanisms. Washington DC: American Psychological Association Press. McCabe-Bennett, H., Fracalanza, K., & Antony, M.M. (in press). Generalized anxiety disorder. In S.J. Lynn, D. David, & G. Montgomery (Eds. ), Evidence-based psychotherapy: The state of the science and practice. Hoboken, NJ: John Wiley and Sons. Rowa, K., McCabe, R.E., & Antony, M.M. (in press). Specific phobia and social phobia. In J. Hunsley and E.J. Mash (Eds. ), A guide to assessments that work, 2nd, New York, NY: Oxford University Press. Rowa, K., Waechter, S., Hood, H.K., & Antony, M.M. (2017). Generalized anxiety disorder. In W.E. Craighead, D.J. Miklowitz, & L.W. Craighead (Eds. ), Psychopathology: History, diagnosis, and empirical foundations, 3rd ed. (pp. 149-186) Hoboken, NJ: John Wiley and Sons. Taillefer, S., & Antony, M.M. (2017). Diagnostic and severity measures for adults with obsessive-compulsive and related disorders. In E.A. Storch, J.S. Abramowitz, and D. McKay (Eds. ), Handbook of obsessive-compulsive related disorders (pp. 873-889). Hoboken, NJ: John Wiley and Sons. Hood, H.K., & Antony, M.M. (2015). Perfectionism-related OCD in an adult. In E.A. Storch & A.B. Lewin (Eds. ), Clinical handbook of obsessive-compulsive and related disorders: A case-based approach to treating pediatric and adult populations (pp. 85-97). New York, NY: Springer. McCabe, R.E., Hood, H.K., & Antony, M.M. (2015). Anxiety disorders: Social anxiety disorder and specific phobia. In A. en, J. Kay, J.A. Lieberman, M.B. First, & M.B. Riba (eds. ), Psychiatry, 4th (pp. 1019-1056). Chichester, UK: Wiley-Blackwell. Antony, M.M. (2014). Behavior therapy. In D. Wedding & R.J. Corsini (Eds. ), Current psychotherapies (10th ed., pp. 193-229). Belmont, CA: Cengage Brooks/Cole. Nowakowski, M.E., Rogojanski, J., & Antony, M.M. (2014). Specific phobia. In S.G. Hofmann (Ed. ), Wiley handbook of cognitive behavioral therapy. Part 2: Specific disorders (pp. 979-999). Hoboken, NJ: Wiley-Blackwell. Rowa, K., Milosevic, I., & Antony, M.M. (2014). Cognitive-behavioral therapy for social anxiety disorder: Applying the approach. In J.W. Weeks (Ed. ), Wiley-Blackwell handbook of social anxiety (pp. 498-520). Hoboken, NJ: Wiley-Blackwell. Vorstenbosch, V., Newman, L., & Antony, M.M. (2014). Exposure techniques. In S.G. Hofmann (Ed. ), Wiley handbook of cognitive behavioral therapy. Part 1: General strategies (pp. 45-65). Hoboken, NJ: Wiley-Blackwell. Gee, B.A., Hood, H.K., & Antony, M.M. (2013). Anxiety disorders: A historical perspective. In T.G. Plante (Ed. ), Abnormal psychology through the ages, Vol. 2, Disorders and treatments (pp. 31-47). Santa Barbara, CA: ABC-CLIO/Praeger. Rowa, K., Hood, H.K., & Antony, M.M. (2013). Generalized anxiety disorder. In W.E. Craighead, D.J. Miklowitz, & L.W. Craighead (Eds. ), Psychopathology: History, diagnosis, and empirical foundations, 2nd ed. (pp. 108-146). Hoboken, NJ: John Wiley and Sons. Hood, H.K., & Antony, M.M. (2012). Evidence-based assessment and treatment of specific phobias in adults. In T.E. Davis, T.H. Ollendick, & L.-G. Öst (Eds. ), Intensive one-session treatment of specific phobias (pp. 19-42). New York, NY: Springer. Koerner, N., Vorstenbosch, V., & Antony, M.M. (2012). Panic disorder. In P. Sturmey & M. Hersen (Eds. ), Handbook of evidence-based practice in clinical psychology: Volume II – Adult disorders (pp. 285-311). Hoboken, NJ: John Wiley and Sons. Antony, M.M., & Roemer, L. (2011). Behavior therapy: Traditional approaches. In S.B. Messer & A.S. Gurman (Eds. ), Essential psychotherapies: Theory and practice, 3rd ed. (pp. 107-142). New York, NY: Guilford Press. Koerner, N., Hood, H., & Antony, M.M. (2011). Interviewing and case formulation. In D.H. Barlow (Ed. ), Oxford handbook of clinical psychology (pp. 225-253). New York, NY: Oxford University Press. Federici, A., Rowa, K., & Antony, M.M. (2010). Adjusting treatment for partial- or nonresponse to contemporary cognitive-behavioral therapy. D. McKay, J. Abramowitz, & S. Taylor (Eds.) Cognitive-behavioral therapy for refractory cases: Turning failure into success (pp. 11-37). Washington, DC: American Psychological Association. Koerner, N., Rogojanski, J., & Antony, M.M. (2010). Specific phobia. In S.G. Hofmann & M.A. Reinecke & (Eds. ), Cognitive-behavioral therapy with adults: A guide to empirically-informed assessment and intervention (pp. 60-77). Cambridge, UK: Cambridge University Press. McCabe, R.E., Ashbaugh, A.R., & Antony, M.M. (2010). Specific and social phobias. In M. M. Antony & D. H. Barlow (Eds. ), Handbook of assessment and treatment planning psychological disorders, 2nd ed. (pp. 186-223). New York, NY: Guilford Press. Summerfeldt, L.J., Kloosterman, P.H., & Antony, M.M. (2010). Structured and semi-structured interviews. In M. M. Antony & D. H. Barlow (Eds. ), Handbook of assessment and treatment planning psychological disorders, 2nd ed. (pp. 95-137) New York, NY: Guilford Press.